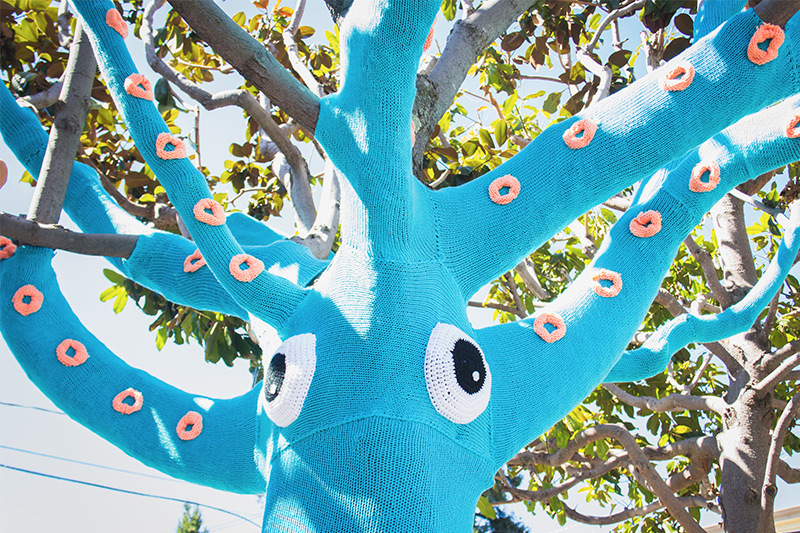 On a rather zany note, how graffiti-knitters have adorned them with remnant wool to create street art. 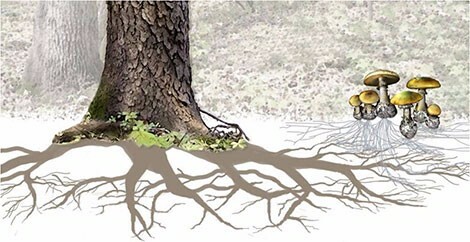 There has been much news recently about trees interacting with one another by sending water, oxygen and nutrients through their root systems.Research by Suzanne Simard, who is a Professor of forestry at the University of British Columbia, has proven that they send signals through the michorrizal fungi which connects the roots of one plant to another, to help them survive and thrive. This is a game-changer in the way we have previously thought about trees as separate entities, managing their resources on their own. The dominant trees or ‘mother trees’ as Suzanne Simard calls them, by virtue of the number of leaves they have, create the most energy through photosynthesis. The excess oxygen, water and nutrients they collect can then be transferred to young seedlings, struggling under shady conditions, drought or any other factors which may impede their establishment in the forest. Her message highlights what most people probably sense already, that everything in nature is connected to everything else and she has sound scientific evidence to support this theory. We have always talked of trees living in ‘communities’ but little did we realise the literal accuracy of the term. Given the effectiveness of the established and extensive root networks of the mother trees to nurture and maintain young tree growth, Suzanne suggests clear – felling as a means of forest management is counter-productive as it denies the young trees access to this intrinsic support. She recommends leaving these few larger trees in place and ‘thinning’ around them to make good use of these established networks…..in other words, to work with nature. 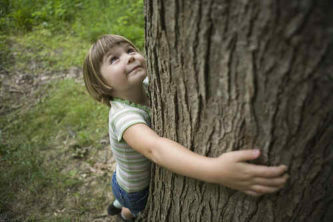 See more on her You Tube videos ‘The networked beauty of forests’ and ‘The science, art and meaning of forest wisdom’. The City of Melbourne have assigned its 77,000 trees individual email addresses in an effort to combat their steady decline due to age, increasing urbanisation and prevailing warmer weather. It’s me again (F). I just got my marks for last semester back! On a definitely completely unrelated note, how do you deal with the constant, relentlessly soul-crushing pain of disappointment after disappointment that characterizes our lives on Earth? You must be very old, right? So I thought you might know. 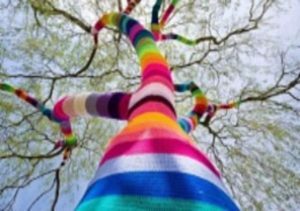 Trees have also been adorned in recent times by group of guerilla knitters known as ‘yarn bombers’ or street artists practicing ‘kifitti’. Originating in Texas in 2005 as a creative way of using left over wool, knitters the world over have been combining art, craft and humour by wrapping trees, lamp-posts, statues, even whole telephone boxes and cars………….that’s up-cycling at its best! One of my favourites is the Giant squid, shown above, by Jill and Lorna Watt in downtown San Mateo in California. Below, a tall stripy tree in Velbert Germany and woman meditatively wrapping wool around a tree outside the Chicago Institute of Art in 2010. We have fairly recently moved from Margaret River, Western Australia to Sydney and even though we miss the vibrant community and the pristine beauty of the region, I have relished ‘swimming in a faster stream’ and the many, interesting landscape opportunities that exist in this creative city. An unexpected pleasure has also been re-familiarizing myself with the vegetation on the East coast especially the abundance of expansive fig trees and the many stately palms which abound in this lush urban microclimate. If there is a project that you feel I would be interested in please don’t hesitate to contact me via the contact form on this website. I received lots of encouraging replies from my last newsletter and would welcome your comments again, as this is intended to be a conversation after all……..